This is the perfect season to make your own fresh basil pesto. Pesto is a versitile and delicious sauce that can be added to pastas, soups or served with fresh bread or crackers. Today at the farmers market, I bought a HUGE bunch of basil, and made four small containers of pesto when I got home. I popped them right into the freezer, in individual containers ready for weeknight meals! Combine all in your food processor, and blend well. I’m just wondering does it have to be frozen or do you have a receipe that can be shelved/jarred instead. Thanks. I’ll do the freezing route as I’ve never preseved/jarred anything inn my life. Yum! I made this with a bit of lemon zest, and substituted some of the olive oil with lemon infused extra virgin O.O. Stumbled upon your site when I was looking for easy muffin recipes. Was just looking at your pesto recipe – you’ve made it entirely without nuts, so I’m assuming the pesto gets its body from the cheese? I make mine with walnuts instead of pine nuts – more body and texture and I also omit cheese but love the taste anyway. Want to try it with pumpkin seeds next – I think it will be healthier. Then I got recently bored of cleaning basil (basil in the monsoons in India need going over with a microscope), so I used spinach instead of basil and it was fabulous. Also easier. Am going to hit coriander next! 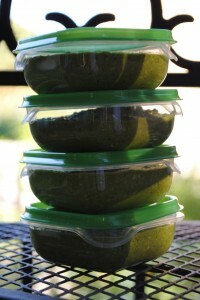 Pesto is something I’ve been making for years because it is so healthy and versatile. It really should have nuts, unless allergies are a concern…as the protein makes it more nutritionally complete and adds more body and texture to the pesto. I generally use walnuts from Costco (cheaper than pine nuts used in traditional pesto and you honestly can’t tell the difference). Pesto is awesome since the ‘greens’ are never cooked/heated. Basil is the traditional pesto, but you can use parsley or other green herbs – or a mix. Pasta with pesto, chicken, red peppers, broccoli, and sundried tomatoes is one of my family’s favourite meals, so I make loads of pesto every fall. I find the cheapest source for the basil is to go right to the farm, where I can usually get a huge bunch for about a dollar.